Timber ETF Update: What are They Holding and How Have They Performed? CUT tracks the performance (before Fund’s fees and expenses) of the Beacon Global Timber Index. The Index is designed to track the performance of common stocks of global timber companies. The fund currently has 27 securities and total assets of $176.9 million as of August 12, 2011. WOOD tracks the performance (before Fund’s fees and expenses) of the S&P Global Timber and Forestry Index. The Index is now comprised of 31 global publicly traded companies that own, manage, or are involved in the “upstream supply chain” of forests and timberlands. As of August 12, 2011, WOOD managed total assets of $222.1 million. 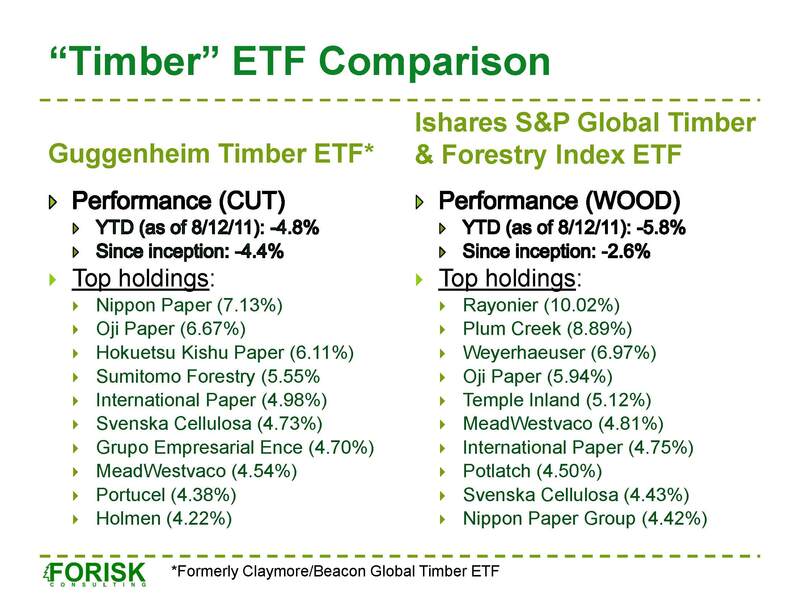 As we noted in November 2010, these ETFs do not provide a good proxy for investing in timber. Why not? In addition to holding equities in firms involved with managing timberlands, they maintain a substantial exposure to manufacturing companies. Of the two, WOOD has a greater weighting towards US domestic producers and timber REITs. While both ETFs show negative returns YTD and since inception, they have had profitable runs. For example, in mid-2009, CUT went on a 72.22% tear while WOOD yielded 46.68%. In addition, both ETFs performed well in the 12-months prior to and through the March 2011 earthquake in Japan, which corresponded to strengthened forest products demand in China.